Still not sure what it is that we do? Martha's Vineyard and Dukes County Fishermen's Association. there. They are also very tasty! Oak Bluffs Library , May 19, 6:30 p.m. Screening of documentary film, Farming the Future: Farm Life on Long Island. Free and all are welcome. raptor, search for salamanders in the woods, and more! Activities, crafts and live birds of prey demonstrations throughout the day. Looking for lunch? Enjoy local burgers and hot dogs by The Farm Institute. Cut a 2” square of real bacon into small chunks and fry until done. Set aside bacon and discard half the bacon grease (more or less depending on how much there is and how much dandelion greens you have). Briefly sauté some chopped sweet Bermuda onion in the pan till barely tender. Toss onions, bacon grease and bacon chunks with cleaned dandelion greens. Serve immediately. Add a bit of Mermaid Farm Feta cheese if you like. No need for vinegar as the greens are tart enough. 1 Rinse thoroughly the watercress, removing old leaves and thick stems. Set aside in a serving bowl. 2 Heat a small stick-free pan on medium heat and cook the bacon until done, several minutes on each side. Remove the bacon from the pan and put on a paper towel. Keep the bacon fat in the pan. 3 Add the cider vinegar and sugar to the bacon fat. Stir to dissolve. Sprinkle with salt and pepper, add a pinch of ground mustard and a pinch of paprika. Taste and adjust seasoning. This is a sweet-sour dressing, so if it is too acidic, add a bit more sugar, if too sweet, add a bit more vinegar. 4 Bring the dressing to a simmer. Pour over the watercress. Crumble the bacon over the top. Toss and serve. 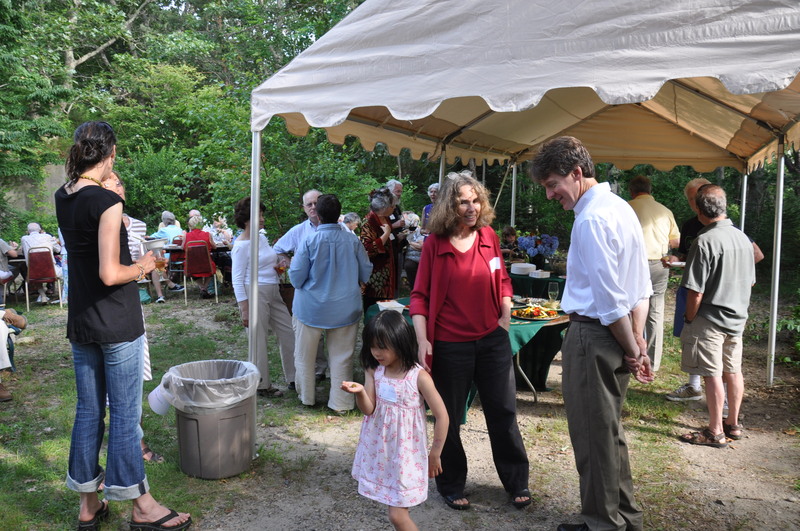 Chances are, no matter where you are on the Vineyard, you are not far from a place that has been made better or left in its natural state thanks to the work of the Vineyard Conservation Society. We are a local non-profit whose success (click HERE to see some of our achievements) depends greatly on our members. If you haven’t already, please renew your membership. If you are not a member and would like to learn more about our work, click HERE and if you like what you see, join us! Well, it’s officially spring, one of the most coveted seasons on the Vineyard! When we returned to our West Tisbury home after a week in Boston, much to our delight the daffodils, crocus and lady slippers were in full-bloom! Dylan, my sixteen month old baby girl, ran around the yard babbling and eagerly smelling most of the flowers (only sacrificing a few) with a grin that lit up her whole face. The neighbor’s house was only slightly visible with the new growth. And the woods were alive! It was indeed a perfect spring day. That same day, on my way to up-island Cronig’s I drove past a gang of wild turkeys, ancient stone walls, stately cedars in meadows of yellows and greens, a blue jay, a squirrel, a horse, three guinea hens, one deer, three friends and a peacock. I looked back at my daughter (who was able to see some of what I saw, but was not quite tall enough to see it all), and I thought, “Wow, aren’t we lucky?” And just like that my winter blues finally surrendered to spring and all her glory! 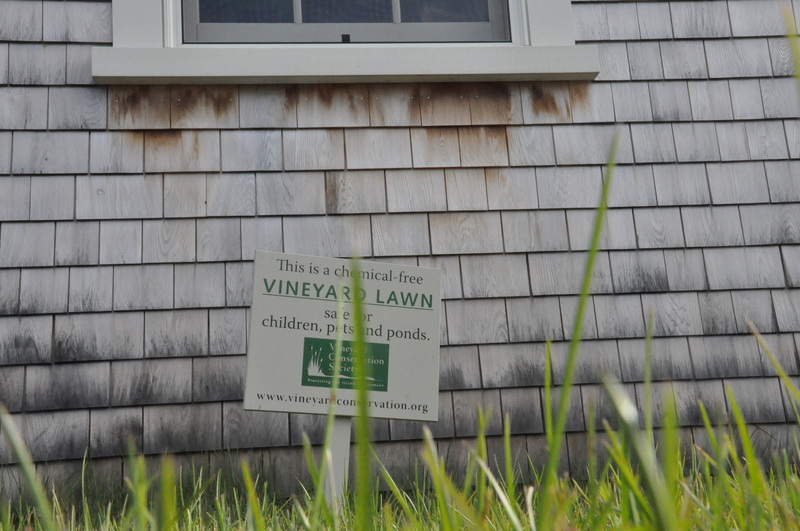 Last month thanks to VCS board member Joan Ames, the Town of West Tisbury agreed to participate in the VCS Vineyard Lawn Program by promoting their chemical-free lawns with VCS Vineyard Lawn signs! Help encourage your town to do the same! email khart@vineyardconservation.org for details. Click HERE for information on the VCS Vineyard Lawn Campaign. What better way to celebrate spring than eating locally and eating wild! A limited number of copies of Linsey Lee’s classic Edible Wild Plants of Martha’s Vineyard is available through VCS (click HERE to get yours!). The well-researched volume contains a wealth of information on preparation and medicinal properties, along with dozens of hand-colored renderings and recipes. Many wild plants found in profusion twenty-five years ago are increasingly scarce. The Island is still a beautiful place, but its plant habitats are strained. The Vineyard’s natural environment offers endless satisfaction and learning if we simply stop and take the time to observe. Enjoy the awareness of the wonder of the natural world around us that this book can help bring, but proceed with caution and respect in gathering. Dates Edible Late March to September. Description: Familiar yellow-flowered plant with rosette of jagged-edged green leaves. Dandelion greens are probably the best known of all the wild edible plants. Dandelion roots and greens are higher in vitamin C and A than most other greens, and the dandelion is always one of the earliest greens to appear and so it gained great favor as a medicinal herb as well as a potherb. 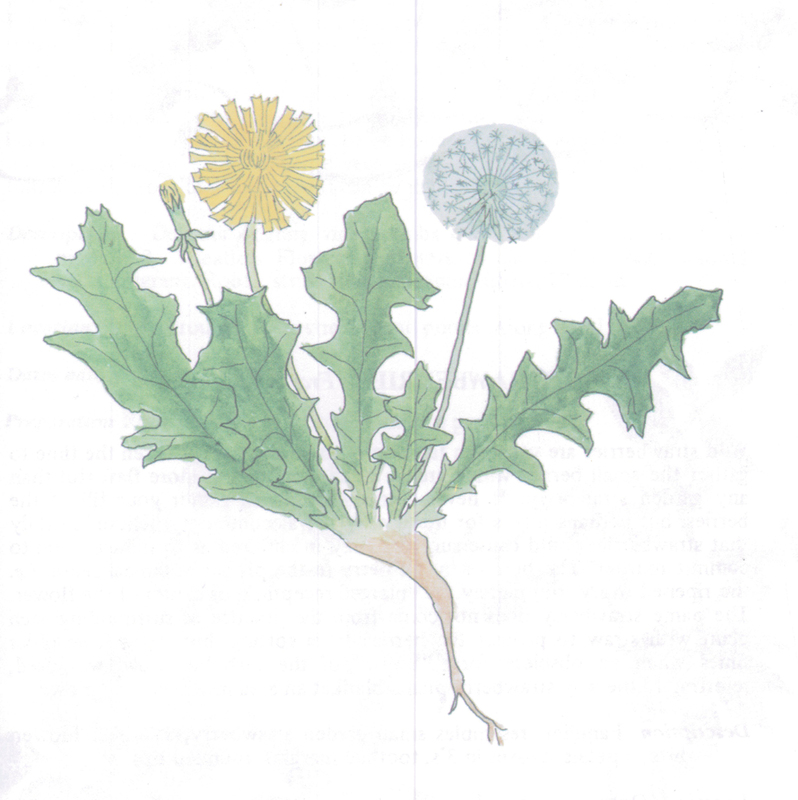 In suburban America people who do not know better regard the dandelion only as an unsightly blemish on their carefully manicured lawns and continue to spend money on vegetables which have been sprayed with chemicals and have a much lower vitamin content. In the days before frozen and canned vegetables, during the long winters people often suffered from a myriad of complaints ranging from blindness to scurvy caused by a severe vitamin deficiency, and so the gathering of the first string greens which so miraculously cured all these ailments was a long anticipated event. One of the concerning impacts of climate disruption on Martha’s Vineyard is an acceleration in the spread of invasive species. These are plants and animals that establish themselves in a non-native ecosystem and cause harm to the environmental balance, often with negative economic and human health effects. These “alien invaders” like Japanese Knotweed (Polygonum cuspidatum) can wreak havoc on critical natural habitats by outcompeting natives for resources. So, while edible plant collectors on the Vineyard are cautioned to avoid indiscriminate gathering of many of our native edibles, Polygonum does not fit that description! All the more reason to take advantage of this edible opportunity. Dates edible May to June. Preparation New shoots resemble asparagus, gather until 1’. Cook like asparagus. Use young stalks up to 3’ like rhubarb. Purple-green, mottled rind must be peeled off. Description: Knotweed is a versatile, wild edible plant – it can be treated both as a fruit and as a vegetable with equally delicious results. Knotweed was introduced as an ornamental plant, resembling a large-leafed bamboo and growing in graceful, shady patches. However, it established itself and spread rapidly, monopolizing any area in which it grew. It is difficult to eradicate. Knotweed also contains a natural phenol called Resveratrolwhich is being studied for its anti-cancer, anti-inflamatory, blood-sugar-lowering and beneficial cardiovascular effects. VCS wanted to send a special thank you to all of the kids who took the time on a Saturday afternoon to demonstrate good stewardship over their environment at the VCS Earth Day Beach Clean-up! A special congratulation is in order for:James Kelleher, Daniel Gaines, Ruby Suman, Everett & Kent Healy, Paul Conroy, Hoffman Hearn, Izabella Morris, Abigail Hammarlund, Ashley Casey and Jason Davies who are this year's raffle recipients for gift certificates to Riley's Reads! Click HERE to read a behind the scenes re-cap on this year's successful event!